2N2222A NPN Plastic Encapsulated Transistor View Secos Corporation. MPSA44 NPN Plastic Encapsulated Transistor View Secos Corporation. 2SB764L PNP Plastic Encapsulated Transistor View Secos Corporation. KTD1304 0.3 A, 25 V NPN Plastic Encapsulated Transistor View Secos Corporation. 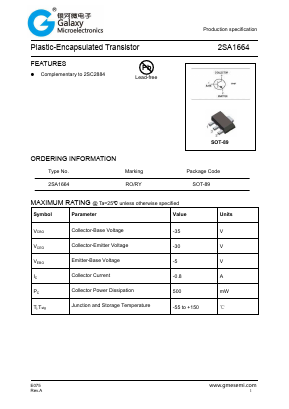 2SB1440 -2 A, -50 V PNP Plastic Encapsulated Transistor View Secos Corporation. 2N4124 0.2 A, 30 V NPN Plastic Encapsulated Transistor View Secos Corporation. 2N4126 -0.2 A, -25 V PNP Plastic Encapsulated Transistor View Secos Corporation. 2N5550 0.6 A, 160 V NPN Plastic Encapsulated Transistor View Secos Corporation. 2N4402 -0.6 A, -40 V PNP Plastic Encapsulated Transistor View Secos Corporation. BC184 0.1 A, 45 V NPN Plastic Encapsulated Transistor View Secos Corporation.